Chicory cherishes a final, peaceful afternoon in the woods with her wolfbond Whitetip. Chicory lay, contentedly nestled against Whitetip's side as elf and wolf dozed in the warm, mid-afternoon sun of late spring. Chicory's face was buried in Whitetip's thick black fur, her nose just behind the wolf's foreleg, as the side of her head rested on Whitetip's ribs. Chicory listened to the soothing sound of his heartbeat pounding gently against that ear. Thump-Thump, Thump-Thump. The pair of friends were napping in a favorite spot not far from Wolfjaw Creek, after watching the slaptails rebuilding a part of their den that had been damaged in a recent skyfire storm. 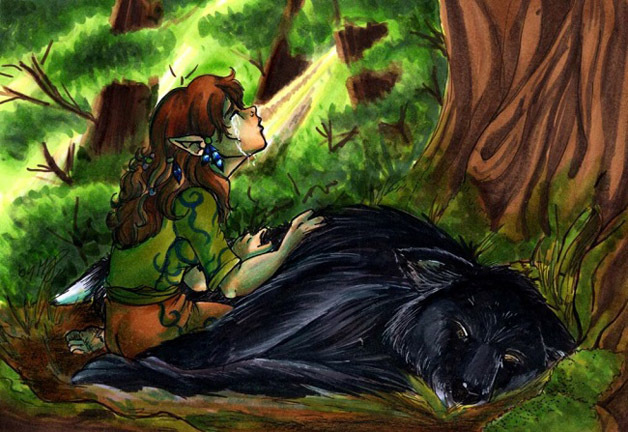 They were still within the protective shelter of the forest, where the pair felt safe enough to completely relax, rather than out in the dangerous open of a meadow, but the bright, cheerful sun still filtered easily enough through the new leaves of the trees to brighten and warm the spot where Whitetip and his elvish companion were laying. It was a peaceful spot, quiet without the activity -- even daytime activity -- of the Holt, and Chicory liked it. There were no interruptions, no sleepless cubs wanting her attention. There were just Chicory, Whitetip, and the sound and vibrations of the wolf's heartbeat. Chicory was suddenly alert to her wolf-friend as Whitetip's heartbeat faltered and slowed. 'What?' she thought, caught off-guard. She did not move, but all of her mind and hearing was focused on Whitetip now. It was true that Whitetip was old in wolf-terms, but Chicory had expected him to live at least another handful of turns if nothing stepped in to cut his life short. Whitetip's breathing was shallower and slower than usual, Chicory noticed now, as well. Chicory allowed herself to doze again, treasuring this last afternoon with Whitetip. She did not send to Cloudfern. This was the Way. There was no use, no need, and no place for his healing skills here. Eventually, the sun drifted down from the sky, and evening approached. Chicory hardly noticed the growing shadows, or the air growing slightly cooler. However, when Whitetip's heart failed to beat again, Chicory noticed that. She waited several moments, ridiculously longer than a heart could go without beating. She did not want to admit it to herself -- not yet. **Whitetip? ** she sent, knowing she would receive no answer, no sense of eager hope for playtime or hunting, from her friend ever again. With a small whine in her throat, Chicory grabbed onto Whitetip's pelt, turning her face into the wolf's side to breathe in his scent and remember him. A moment or two later, she realized that Whitetip's fur was wet against her face. Chicory had been crying. For some time now, she realized; not merely since Whitetip had actually died. ...and celebrating the time they had shared.